Scooter and motorcycle rentals in Chiang Mai. A motorcycle ride can be done with a scooter, for example a Honda Click 125cc or a Honda Wave 125 cc. If you prefer a dirt bike then a Honda CRF250 (Enduro or dirt bike) is also possible. Plenty of larger bikes are available like a Honda Phantom, a Honda CB500F, a Kawasaki Ninja 650 or Kawasaki Versys. Most motorbike and scooter rental places in Chiang Mai are close to Thapae gate like Mr. Mechanic motorcycle Rental, C&P Big Bike (moved to 21-23 Lamphun Road in 2018; on the east side of the river), Pop Motorcycle/Car rent (Kotchasarn Road), Dang Bike Hire (Kotchasarn Road), Ratchamanka road). At the largest POP store, the Pop Motorcycle main store on Kotchasarn Road, on the eastern moat there are dozens of big bikes on display. Pop Motorcycle has fast big road bikes like Kawasaki Versys 650 at 1800 THB and Kawasaki Ninja 650 for about the same price. Pop has several motorbike locations throughout the city (besides the large Pop Motorcycle there is also Pop Rider and several small Pop Motorbike shops) but they are one of the most expensive and they get rather bad reviews for the service. Walk around a bit away from Tha Phae gate to find a cheaper rental office; a Kawasaki Versys or Honda CRF250 can be rented cheaper if you visit some other bike stores not far from Thapae gate. I can recommend M25 Motorbike rental on Ratchamanka road, not far from Tony's Big Bikes (TBB). In 2018 Tony's Big Bikes bike shop has been sold to Toons Bike rental, and Toons Bike rental have similar rates to Pop Motorcycles. Tony's Big Bikes; which only organises tours has moved to a location south of the old town. Pop Motorcycle main store, Kotchasarn Road Chiang Mai. Bike shops like to keep your passport as safeguard; but most motorcycle rental shops also accept a deposit of 2000 to 3000 baht for a scooter and 5000 baht for a motorcycle. An international driver's license is also a requirement but is not checked when renting a bike. The longer you rent a bike, the cheaper the daily rate can be ... negotiate! A 250CC trail bike like the Honda CRF-250L rents for 800 baht per day, but for 5 days or more 700 baht per day. The newer 2017 Honda CRF250 Rally is more expensive. Outside the high season a determined haggle can bring rental fees down; during high season this won't work. There are lots of scooter rental places in Chiang Mai all over town. Most are small shops, for example on Moonmuang Road, the street along the moat north of Taphae Gate there are quite a few. The Honda Click, Honda Scoopy and Yamaha Fino are common scooters for rent; the cost can vary widely but most are in the range of 150 � 250 baht a day. The more powerful 125CC scooters will be over 200 baht a day. 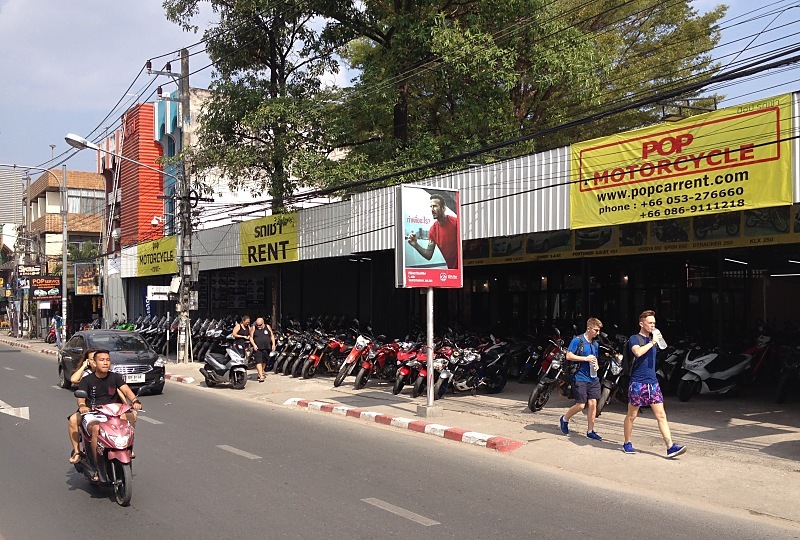 A scooter rental shop with good ratings is Cat Motors on Manee Nopparat Road (the road just north of the moat). Bamboo Bike Rentals has also good ratings; it is located on Chaiyapoom Road (on the eastern moat road, opposite Somphet market) and has the cheapest scooters starting at around 120 to 150 baht a day, but they are not the newest or best scooters. You can buy additional insurance when you rent a scooter. In Thailand all motor vehicles and scooters have by default third party insurance (damage caused to OTHER vehicles in case of an accident). The damage to your own bike can be covered by this additional insurance which is around 100-250 baht a day. Mr.Mechanic has this insurance included in the rental price, but it has an own risk component (Excess). The �excess� is the amount of money you will have to pay the rental company if your hired motor vehicle gets damaged. The regular police check in Chiang Mai. Notice the old blue "Half helmet". Open face 3/4 helmets (left) are better than these Half helmets. Police Checkpoints and IDP drivers license. Since 2017 the Thai police have set up daily checkpoints in Chiang Mai where all foreigners' licenses are checked. Motorcycle and scooter drivers need to show an International Driving Permit which should include a motorcycle license. They will also fine you if you don't wear a helmet. In many European countries one does not need a motorcycle license for mopeds: small bikes of 50CC. This is not the case in Thailand where scooters are more powerful. Most scooters for rent in Thailand are 100 to 125CC and can easily do 80 to 90 km/hour (50-60 miles/hour). Therefore all scooter drivers need a valid Motorcycle license and an International Driving Permit. An International Driving Permit or International Drivers License is required for motorcycle driving in Thailand but this is not checked when you are renting a bike. The International Driving Permit (IDP) is NOT a license to drive, only a translation of your countries license. At the Thai police checkpoints the police will ask for your IDP which should show the motorcycle endorsement if you drive a scooter. If you don't have a motorbike license then your international permit won't cover scooter driving. The fine for not having an International Drivers License is 500 Baht. 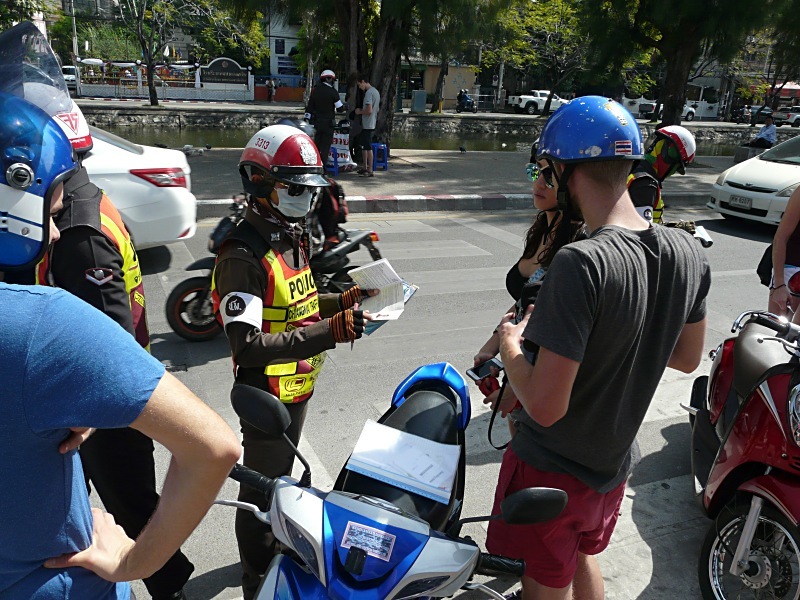 Many scooter drivers who are stopped at Police checkpoints complain of extortion. They seem to believe that since they are valued foreign tourists they don't have to obey any road rules and can get away with anything. However, International Driving Permits (IDPs) are just like your home license. If you have a motorcycle endorsement on your home license, you will have a motorcycle endorsement on your IDP. In a European license that is the A1 or A2 category; in the USA a motorcycle license is class M. If you do not have that endorsement, then you are not legally permitted to drive a motorcycle or a scooter, so the police can give you a fine. If you were at home and did not have a motorcycle license and the police wrote you a ticket, would that be extortion? If you do not have a motorcycle license at home, you shouldn't be driving a motorcycle in Thailand, period. Many scooter drivers are under the impression that they can do whatever they want because they are on holiday. They get annoyed at police checkpoints and fines; however the police are simply enforcing the law. One positive point: your fine will give you an exemption for new fines for three days. If you can show your ticket you won't get another fine. Travel insurance companies have in the fine print that you must have a motorcycle license in the event of a claim for accident damages or medical costs. You are not covered for any medical cost if you rent a scooter without a proper license. +MORE on the Licence requirements for car rental companies. Licence requirements for car rental companies. Renter must hold Driving License or International Driving License at least one year. All drivers must hold a current, non-probationary license. The license may either be Thai, or from a renter's country of residence (with an English translation) or an international drivers permit. Must hold a valid Thai driving license / International Driving Licence or a driving license from a renter�s country of residence (with an English translation). All renters must produce a valid Driving license, Passport and/or Identification Card with their name when pick up the car. An International Driving Licence or a Notarised Translation of driving license is required where the driver�s licence is not in English. A passport is asked for by all rental companies; but not an International Driving Permit (IDP). However, at ALL the Thai police checkpoints the police will ask for your International Driving Permit. Most travel insurance companies have in the fine print that you must have an International Driving Permit in the event of a claim for accident damages or medical costs. You are not covered for any medical cost if you rent a scooter without a proper motorcycle license. Leave your big backpack home when you go to Pai..
One in ten killed are foreigners! In Chiang Mai province from January to November 2018 there have been 13.051 accidents resulting in 246 deaths and 14.465 injuries. Of these, 25 deaths were foreigners and 1.100 of the injured were foreigners. More than 1000 foreign tourists and expats dying or injured in Chiang Mai province alone so far in 2018. Ten percent of the people that die on Chiang Mai�s roads are foreigners. The statistics also reveal that the overwhelming majority of deaths and injury were on motorcycles. Most deaths were 16-25 year olds and occurred between 6 pm and 10 pm. So it is best to drive safe, get your International Driving Permit and try not to end up in hospital. It could spoil your holiday somewhat. en.wikipedia.org - International Driving Permit on wikipedia. wikivoyage.org - Pai on wikivoyage. wikipedia.org - Pai on wikipedia. "Travel is not a vacation, it's an experience.". All photo's copyright © 2016-2018 Rolf Schierbeek, Netherlands.